I had time for a little sewing project too. Fabric selected from my stash a few days ago turned into a the most useful storage system for circular knitting needles. The pocket at the bottom is perfect for spare needle needle tips and cables. It has made me think about what circulars I prefer – possibly KnitPro Symphonie with fixed tips for their smoothness and attractiveness = I always say the rainbows make even black knitting pretty! I like the interchangeable ones but have had a bit of bad luck with rough fixings and occasionally the screw has unwound despite all my efforts with regularly fixing the tips on. So two projects down, still numerous ones to be tackled, but this is progress, yay! This entry was posted in Uncategorized and tagged Alpaca, circular, DROPS, knitpro, knitting, LIttle Woollie, needles, yarn. Another week into 2018. Am I keeping up my Enthusiams? Yes, the dieting has been going well, despite eating out twice, according to my own bathroom scales I am still more or less on track. My view is, enjoy food, enjoy company, be extra sensible when eating at home. the two counterbalance each other and life doesn’t get boring! Craft sorting is slow but still sorting. Another yarn project ripped back and well into the reknit. Another Drops Andes project, it was a short sleeved jacket, a DROPs pattern which just was a disaster, now it’s 3/4 of a cushion using a Sirdar pattern when gauge this time is not so important. A little fabric project has also been decided upon – will blog pics when finished – technically this will become a fabric/yarn combi project. Any guesses? Job/Career – a few prospects thought about, one visited, no conclusions yet. Who would have thought of a coffee shop run from a horse box parked in a restaurant car park? That was just one opportunity. Yes, really! Bucket list – the bucket is empty at the moment! Happy crafting and creating. Another week, another zillion projects in the making! This entry was posted in Uncategorized and tagged cauliflower, craft, diet, DROPS, knit, ripped, Sirdar. Keeping up ‘Enthusiasms’ for the new year (see yesterday’s post) I’ve had a ripping afternoon. I remember starting this when a lovely new wool shop, Little Woollie in Beckenham, Kent opened. DROPS Muscat, a beautiful mercerised cotton, three different shades. I found the pattern and the knitted piece ‘hidden’ in my craft room. I was trying to adjust a child’s pattern and as it grew realised it wasn’t going to work out how I imagined. I struggle with the gauge of DROPS yarns sometimes. Does anyone else? This is what I have now. I am happily satisfied rather than guilt ridden with yet again another WIP or a UFO. A mini project of the future! This entry was posted in Uncategorized and tagged Beckenham, DROPS, knit, LIttle Woollie, UFO, WIP. Ta da! Just a hat, but a great knit. I loved making it so much and I had enough yarn left – so I made another one exactly the same for myself. We live about 180 miles away from each other so there is little chance we will bump into each other wearing it – though maybe that would be fun! I am already thinking about the changes I shall make for the better in 2018. There will be more organised crafting time for one thing. There will be a little entrepreneurial thinking, some work will be sorted and I shall spend more time with loved ones far and near. I shall be glad to see 2017 gone. If you are on a mid Christmas/New Year break then I hope you are having fun. This entry was posted in Uncategorized and tagged 2018, crafting., DROPS, knit, wool, yarn. It’s getting chillier and chillier in the S E of England. What an excuse to sit and knit – do I ever need an excuse? Actually, no, knitting is like breathing to me. Sadly, sometimes those ‘breaths’ are a little more successful than others. For a new cowl I made this week I used Rico Creative Bonbon yarn. I didn’t like working with it and I don’t actually love the cowl itself. I am already thinking it will pill easily, a miff for yarn crafters! 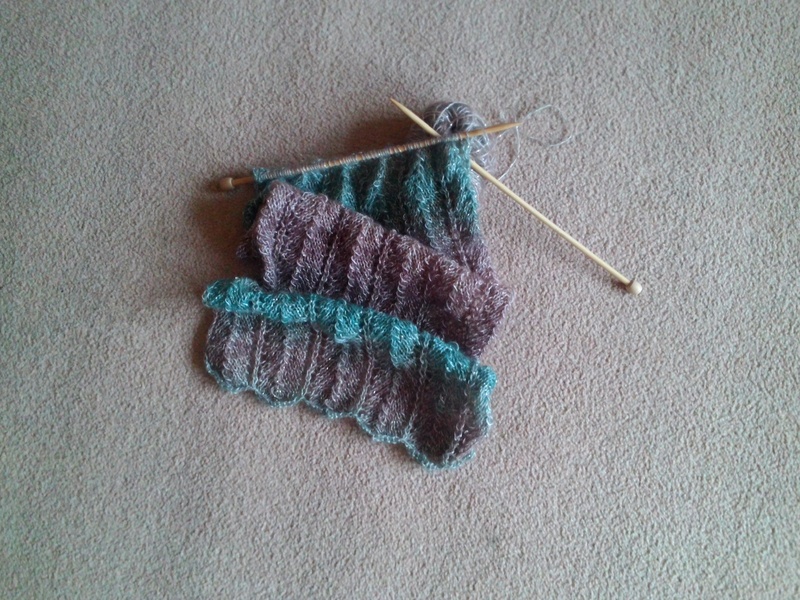 I was playing with a scarf pattern which was supposed to be on smaller needles with skinnier yarn. I knitted a short length with this super chunky yarn and sewed the ends together to get it over and done with. The hat is made from DROPS Nepal – now, I love this yarn – but I hate the hat! I fudged a hat pattern which should have used a different yarn gauge again, and made up a lot as I went along (ripping back and reknitting more than once). Together this pair of purply things look ok on the model head but this time the creations don’t make me smile widely. Talking of colours, purple in this case. Have you ever looked at your stash of yarn and thought ‘hey, 50 shades of grey/purple/pink/fill in the blank’? I guess I have a lot of purple in mine, perhaps not 50 shades but it’s a close thing between purple and green. What are your 50 shades? Back to the two sticks now. Hopefully the next project is more of a success. I am still working on several WIPS which I dip in and out of. These two items were supposed to be quick knits (they were), to satisfy my soul with a start and a finish of something tangible. This entry was posted in Uncategorized and tagged 50 shades of grey, crafters, DROPS, knit, rico, yarn. What to make in speckles? Today I was going to have a huge sort out of my craft room – oops – that didn’t quite happen again. Am I the only one who is tempted to leave the jobs for another day when a social engagement calls? (An overdue catch up with a friend in this instance.) I will return to the crafty chaos at a later date. After a very little sort out (more of a dive in, then a rummage in a crate of leftover baby yarn ..) I found this pretty green DK yarn, Sirdar Snuggly Baby Speckle. I feel a mini knitting project coming on. About 80g in weight. A hat with a bobble perhaps? I know of a new boy baby arriving shortly. I also have a friend frantically knitting hats for a hospice Christmas Sale. There may be competition for the finished item. Still, it will be a quick knit amongst the other WIPS. I need a break from the two projects next to my sofa (the ongoing DROPS project and also something for work). If today you are knitting/stitching/hooking/sticking/painting/sculpting/designing I wish you a Happy Crafting session! This entry was posted in Uncategorized and tagged DROPS, hats, hooking, knitting, Sirdar, stitching.